On 4 November, Socialist Party Ireland MEP, Paul Murphy, was detained by the Israeli Defence Forces, along with other activists from the Freedom Waves Flotilla. The flotilla - the Irish ship, MV Saoirse, and the Canadian ship, the Tahrir - attempted to travel to Gaza in solidarity with the suffering Palestinian people and to deliver humanitarian aid. The Israeli Navy deployed a high-powered water cannon against the deck of the Saoirse. The protesters were taken into the custody of the Israeli police and the immigration authorities charged them with the "crime" of entering Israel "illegally". In fact, they were kidnapped in international waters on their way to Gaza. Paul Murphy MEP was able to make a three minute phone call from Givon prison, in Israel (which the prison authorities listened in to). Paul gave a vivid account of the ill treatment he and his fellow prisoners endured: "Our boat was almost sunk by the manner in which it was approached and boarded by the Israeli navy. People were shackled and deprived of all personal belongings. "In Givon prison, the authorities tried to disorientate us through sleep deprivation and the removal of our watches and the prison clock recording the wrong time. We have been given no time frame as to how long we will be kept here before the deportation trial. We were denied our right by Israeli law to contact our families within 24 hours of our arrest. "On the basis of protest action we have engaged in, our treatment has improved and we have had books and writing materials returned to us. "We remain defiant and unabashed in our mission, which again has served to expose the criminal nature of the Israeli state in its blockading of Gaza from those of us who wish to provide aid in order to alleviate the poverty and suffering the people there endure." CWI supporters in Israel are campaigning for the release of Paul and all those detained, including holding protests in Tel-Aviv and Haifa. 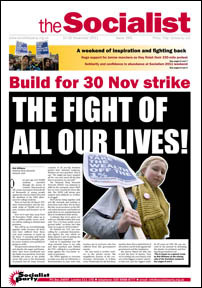 They protested on Monday 7 November, which coincided with a general strike across the country (see below). Also on Monday the Irish Ship to Gaza Campaign demonstrated outside the Department of Foreign Affairs, Dublin. The CWI (the socialist international organisation to which the Socialist Party is affiliated) appeals to readers to immediately protest to Israeli embassies/consulates in your country or to the nearest Israeli embassy/consulate, demanding the immediate release of Paul Murphy and all other activists from the Saoirse and Tahrir. Ministry of Defence PR dept. As the Socialist goes to print we have heard that Paul and the other protesters have been sent back to prison. Their lawyer argues that this is a politically motivated attack. The protesters have been receiving further rough treatment with reports of the use of taser guns on prisoners and strip-searching. A protest will be called on Wednesday 9 November at the Israeli embassy in London to demand their immediate release with further action to follow if they continue to be detained.